Eddie Waring's The Great Ones & Other Writings is the fifth book in Scratching Shed’s Rugby League Classics range and a real eye-opener for those who think they know the one-time BBC rugby league commentator. First published in 1969, the original Great Ones has assumed almost mythical status among followers of the 13-a-side code. 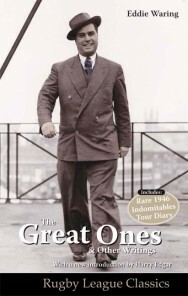 This updated edition also includes Waring's rare 1946 Indomitables Tour diary, first published in 1947. This is a must-have volume for every fan of rugby league. Paperback, 320 pages. The fifth and latest book in Scratching Shed Publishing’s Rugby League Classics range is Eddie Waring’s The Great Ones and Other Writings. First published in 1969, the original Great Ones has assumed almost mythical status among followers of the 13-a-side football code thanks, in large part, to its rarity. The book is Waring’s personal take on some of the greatest rugby league players of all time, all of it written in his own idiosyncratic and entertaining style. Also included in this new edition is Waring’s highly readable account of the 1946 Indomitables Tour of Australia and New Zealand, along with assorted other writings from various publications which reveal that there was much more to this legendary broadcaster than met the eye - and ear! Rebranded as part of the Rugby League Classics range, this fifth book in a popular series also comes complete with a brand new introduction by esteemed rugby league writer Harry Edgar and an afterword by Eddie’s son, Tony Waring.